Twin Bridges Village is an active lifestyle community in Edmond, Oklahoma. It features 72 new single-family homes. A gated community with a lovely clubhouse, Twin Bridges Village promises high-quality living and extravagant amenities. Residents can enjoy strolling along walking paths or even fishing in the nearby Twin Bridges Lakes. Conveniently located within the Oklahoma City metropolitan area, Twin Bridges Village has the luxuries of both city and suburban life. With amenities meant to encourage relaxation, Twin Bridges Village is perfect for homeowners who place a premium on a luxurious and low-maintenance lifestyle. At the heart of the community is the planned clubhouse. Inside, there is a large common room with a catering kitchen. Within the clubhouse, there will be a large TV and plenty of seating for game-day watch parties. A fitness center is currently in development and will also be housed in the clubhouse. A scenic waterfall on the outdoor patio near the pool is also planned. Residents can jog or go for a morning stroll along the paths laid out throughout the community. There are 72 modern single-family homes available in this community. Homes range between 1,970 square feet and 2,711 square feet. The houses in Twin Bridges Village have three to five bedrooms, two to four bathrooms, and attached two to three car garages. Interior designs are sleek and contemporary in these homes with modern, energy-efficient appliances and fixtures. Residents of Twin Bridges Village enjoy a carefree way of life. The 24-hour gated entrance contributes to the atmosphere of comfort and worry-free living. Whether homeowners are looking to relax poolside or have a potluck in the clubhouse, this community offers something for every lifestyle. Irrigation and lawn maintenance are also provided at Twin Bridges Village. Edmond, Oklahoma is conveniently located just over 30 minutes outside of Oklahoma City. Daily shopping is easy with a Walmart Supercenter, a Kohls, and other retail stores just over five miles away. For more shopping options, the Bryant Square Shopping center is less than 15 minutes from the community. Lake Hefner is just over 30 minutes away and is a popular destination in the region for fishing and boating. For long-distance travel, Will Rogers World Airport is just about 40 minutes from the community. 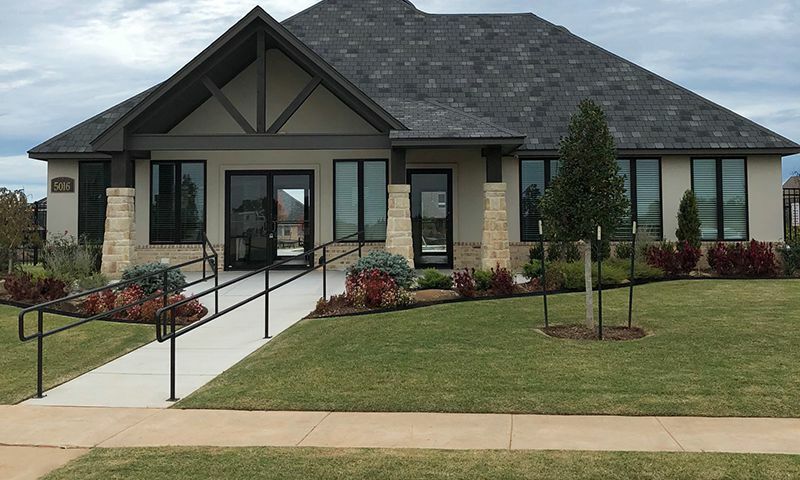 Twin Bridges Village's combination of modern homes, luxurious amenities, and a great location make it an excellent choice for homebuyers looking for a low-maintenance community near Oklahoma City. There are plenty of activities available in Twin Bridges Village. Here is a sample of some of the clubs, activities and classes offered here. 55places.com is not affiliated with the developer(s) or homeowners association of Twin Bridges Village. The information you submit is distributed to a 55places.com Partner Agent, who is a licensed real estate agent. The information regarding Twin Bridges Village has not been verified or approved by the developer or homeowners association. Please verify all information prior to purchasing. 55places.com is not responsible for any errors regarding the information displayed on this website.